John Williams had a trained bird act that he plied at both Ocean Beach and in the vicinity of the Cliff House from the late 1880s until 1907. Originally appeared in WNP Member Newsletter, Fall 2006. 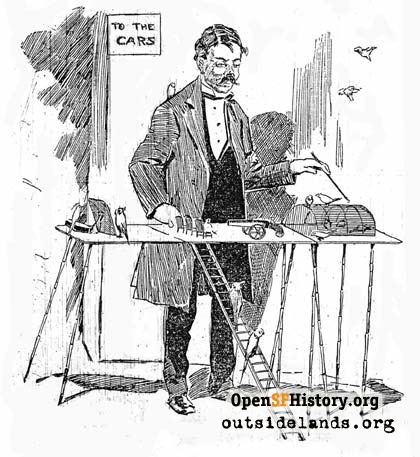 Many people have heard of Robert Stroud, the so-called "Birdman of Alcatraz," or Mark Bittner, the bird lover who is known from the book and movie, The Wild Parrots of Telegraph Hill. 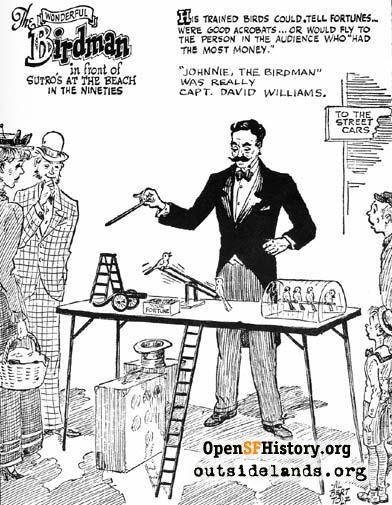 But before either of these men achieved notoriety, there was Johnnie-the-Birdman in San Francisco. 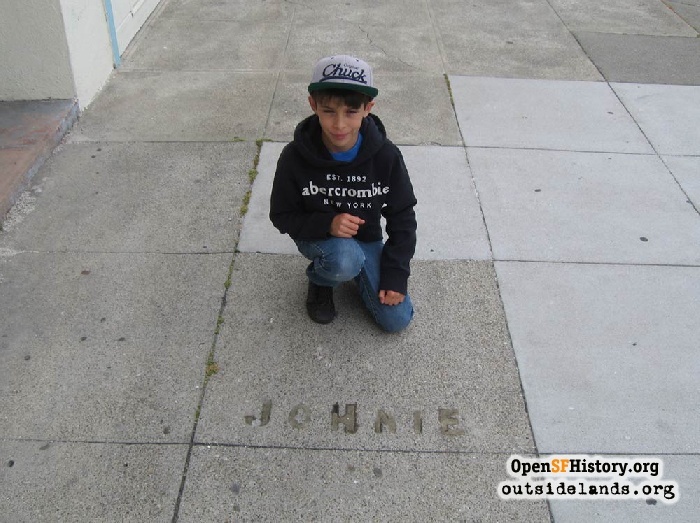 Johnnie was John Williams, a reclusive English-born bachelor, who had a trained bird act that he plied at both Ocean Beach and in the vicinity of the Cliff House from the late 1880s until 1907. Albert Tolf illustrated the Birdman's work in the San Francisco News., 1950s - San Francisco News, art by Albert Tolf. For twenty years, Johnnie could be seen every day from 1:00 to 4:00 p.m., engaging the visitors to the Cliff House area to give a few coins for "seed for the birds." 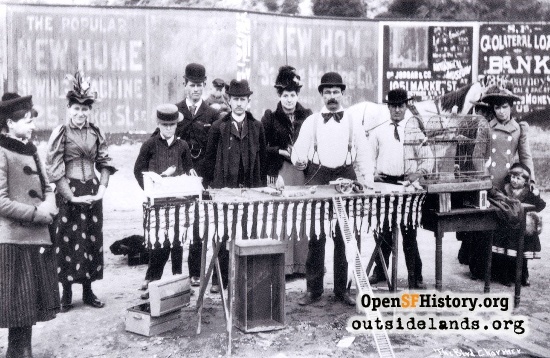 Starting in 1887, Williams set up his folding table at the terminus of the Park and Ocean Railroad, at what would be La Playa and Balboa Street today. He later moved his act up nearer the Ferries and Cliff House Railway terminus by Sutro Baths. Wherever the crowd gathered in the area of Land's End, Johnnie-the-Birdman was there to entertain with his flock of assorted canaries, parakeets and lovebirds. His act seemed simple, but it was clear that he had devoted hours to training his flock of performers. He would wait for a small crowd to gather, usually by the train depot, and then start a dialogue with his feathered friends in a cheerful Cockney accent. Addressing each bird by name, he inquired if they would come out of their cage and "give the ladies a treat." Cora Older, wife of newspaper publisher Fremont Older, wrote in the San Francisco Bulletin in detail about this "cunning, perceptive... and droll" man and his ability to engage a crowd and extract coins from their purses.1 Williams "worked" his crowd first by engaging the women because, as Cora Older observed, "they gave freely and with pleasure, while the men stood by and sulked." Once the crowd was interested in the antics of the birds, he took them to a point where the feathered acrobat balked, and then he'd say, "The darlings can't do anything very well unless they `ave some seed. Now, we'll see if the ladies are willing to give the birdies some seed." Once the pennies and nickels were produced, the act proceeded, with the birds climbing ladders like firemen, admiring their dress costumes in the mirror or firing the toy cannon at a bird who keeled over playing dead. Johnnie further involved his audience with the line, "Now pick out the one in the crowd that's goin' to `ave a lot of money come to `um," and the obedient bird would fly over and perch on the hat of the lady who had given the most money for seed. To culminate the act, he'd coax a few more coins out of the crowd with the promise that one of his "darlings," as he called them, would sing a song, but it had to be a melodramatic "sad song." He promised that if his bird failed to sing the song, he would reward all present with a bird, and then close up shop. The chosen bird then sang We Shall Meet on That Beautiful Shore on cue. The bird sang it too loudly and joyfully, so Johnnie reprimanded it to "sing soft and sentimental and make `em cry." For twenty years, Johnnie's birds never failed him. John Williams delighted pleasure-seekers in the vicinity of the Cliff House for two decades. He ceased performing when the crowds diminished after the September 7, 1907 fire that destroyed the chateau-style building. One-and-a-half years later, John Williams died in his home in the Richmond District, "alone with his pets, chirping merrily about him. "2 His obituary further said, "...he was unable to read or write, yet must have had considerable ability to accumulate property," because he owned his home at 328 Eleventh Avenue and at least one other lot on the block. 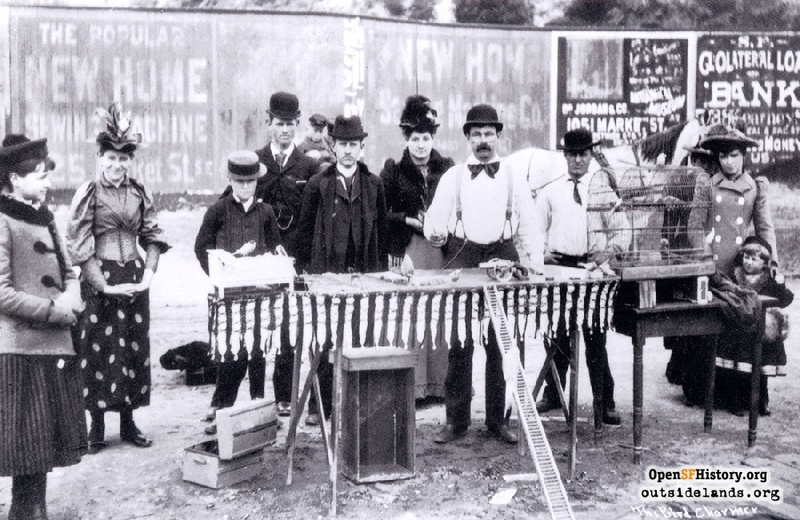 For years, he had lived in rented rooms and saved the coins he coaxed from the crowd near the Cliff House, finally buying property only a few years before he died at age 50. I remember, as a kid in the 1950s, walking that block and being puzzled by the words "Johnnie-the-Birdman" boldly written in the cement on the property line between 350 and 354 Eleventh Avenue. I made a trip there recently to see that all of the large letters have been filled in; "Johnnie-the-Bird" can still be made out, but the "man" is gone. 1. San Francisco Bulletin, February 27, 1897. 2. Richmond Banner, March 26, 1909.